Please refer to our stock # 10806 when inquiring. This wonderful vintage belt was designed by costume jewelry legend, Kenneth Jay Lane. 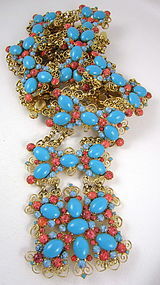 It is 31 1/2" long x 3 1/2" wide and has a gold tone setting elaborately set with turquoise and coral cabochons. It is signed K.J.L. on the reverse and it is in excellent condition.